LinkedIn, the boring social network that won’t find you a date but may land you a job, is expanding beyond people profiles. On Friday morning they will launch company profile pages that partly serve as fact sheets for about 160,000 companies and partly serve to reveal the connections that members have with them. These private pages (you have to be signed in to see them) pull in some information from Capital IQ, a sister company to BusinessWeek, such as company descriptions, industries, types, statuses, headquarter addresses, sizes, founding dates, and websites. Many of the companies to which people belong on LinkedIn, however, aren’t big enough for Capital IQ to recognize them. 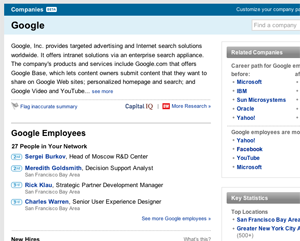 So the bulk of the data shown on these company pages comes from LinkedIn’s own knowledge of people’s careers. 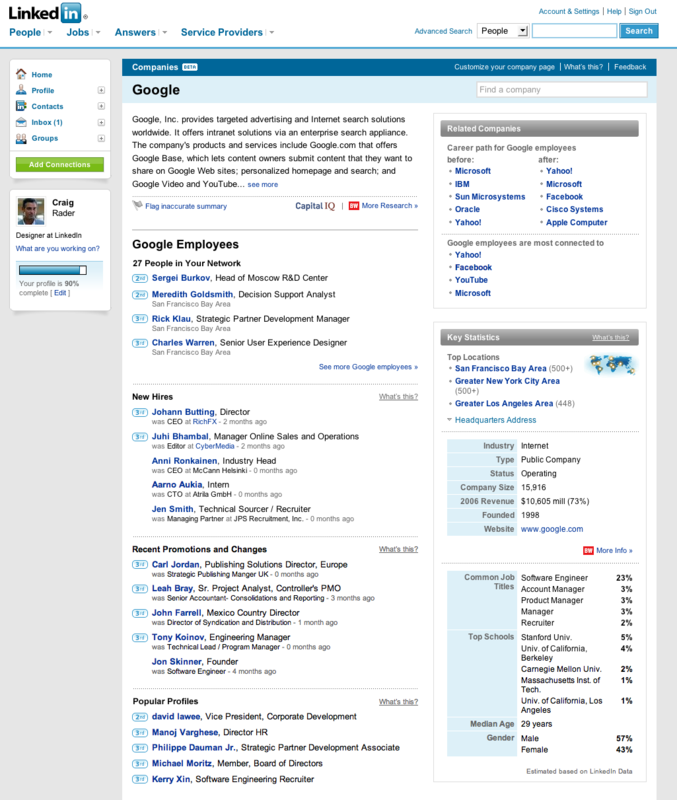 LinkedIn uses this knowledge to display recent hires, related companies, recent promotions, top locations for employees, and so-called “popular profiles” (people who get lots of profile views and mentions in the press). The data has also been used for company comparison purposes. You can see which companies employees usually come from and leave for, as well as which companies the current employees are most connected to. Additional features include relevant news articles to a company (first discovered on LinkedIn last December) and personalized job listings. The addition of company profile pages (which, dare I say, remind me of Facebook network pages) and the plans for more user generated content are good moves for LinkedIn, since the company needs to give users better reasons to return and use the site on a regular basis. LinkedIn says it attracts one million new users each month and plans to have company profiles for a million companies. The social network has raised $27.5M so far.